Gerber Empower Automatic Gray/ Black Fine Edge Knife S30V 30-001325. 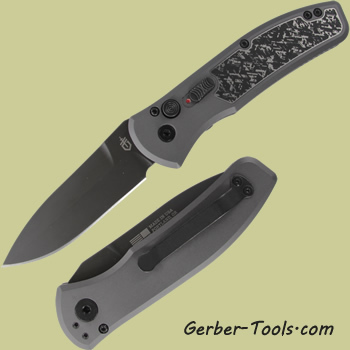 The Empower is a military-grade automatic knife based off of the Gerber Propel. If you thought the Propel was fast then you will think the Gerber Empower is WICKED FAST! It has an easy-to-operate and safe-to-stow design built with Type III hard anodized construction. It utilizes a 3.25 inch 30V steel w/ black oxide coated blade and features Armored Grip™ handle plates, offering both reliable control and a striking no-slip design. It also features a lock and safety slide and a reversible pocket clip. This knife will surely empower anyone who carries it. Made in the USA. This is the Gerber Empower model 30-001325 so if you are ready to feel the power then you need to get an Empower in your hands. This is an automatic (knife) so this will require credentials in order to buy. It is a fine edge you'll see well in grey and black so they really just put some style to this which is makes this a really intricate and interesting knife, different from the front to the back. First of all you'll see here the black and gray scales just really make this look good. This blade is made with the S30V steel that blade is 3.25 inches. Overall we're at 8.4 inches and weighing four point six ounces. This also has a black oxide coating on the blade. Now the handle here they call this an armored grip. It's a nice jimping here on top and bottom finger groove. This is a type 3 hard anodized construction again with your plunge lock so we can lock it into an open we can also close it push down. The button and now it becomes safety locked so that way it's not going to open or fire up in your pocket there. The black pocket clip on the back and then as you see it now it turns into just total silver on the back, okay? Proudly made in the USA but again unlock it you'll see the power of just that one push of the button. You will see here the flag and where it says made in the USA. Portland Oregon stamped there on the back you get a nice grizzly bear face card when you get this knife so feel "empowered" with your Gerber Empower model 30-001325!